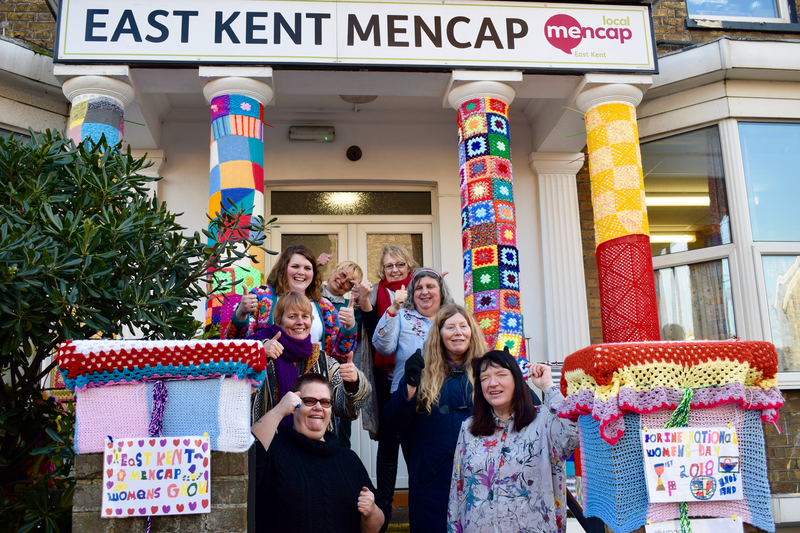 On the eve of International Women’s Day (Wednesday 7 March), East Kent Mencap’s Women’s Group carried out a yarn bomb by decorating the charity’s building with colourful wool creations. Following the yarn bomb, the group hosted a celebratory tea. Later in the afternoon they attended POW!’s opening night at Turner Contemporary where some of our friends performed in the community choir. The East Kent Mencap’s Women’s Group, Creative Adults Project and kind members of the public have been meeting secretly to knit and crochet squares, bunting and make pom-poms since last year. International Women’s Day is a global day celebrating the social, economic, cultural and political achievements of women. POW! Thanet is an annual festival of Arts and Culture which celebrates and explores issues around Feminism, Women and Girls. It coincides with International Women’s Day with the goal of encouraging community involvement in local arts and cultural activities, and profiling the work of local female artists. The following morning, visitors, staff and passers-by were in a spin to find the building in Margate had been transformed into a woollen wonderland. Raise awareness of International Women’s Day and POW! Make a bold statement about our Women’s Group who are all women with a learning disability. So much to do with charity work and people with a learning disability is perceived as a bit ‘worthy’, out of necessity or just dull. But we also do fun things and we wanted to showcase this. We also wanted to connect with the local community, through our secret knitting and crochet group, which had been meeting for several months leading up to the yarn bomb and involved members of the Women’s Group, Creative Adults Project (for people managing physical and mental health issues) and anyone else who enjoys crafting with wool. It brought together women with and without a Learning Disability to work together on an idea. Everyone’s contribution was valued and everyone brought something different. Even people who couldn’t crochet or knit, helped with posters, research or planning the celebration tea. We wanted to show what women with a Learning Disability can do and what women together can achieve to create a bold statement to the community that we are here, Women loud and proud! There wasn’t a plan or a leader, we worked together and things evolved. It’s a yarn bomb – what could be more punk! Don’t stereotype us, let us be ourselves and don’t ignore us. This is what we can do! People stopped and starred, we got noticed! There wasn’t a plan or a leader, we worked together and things evolved. On the day we took everyone’s contribution and anarchy ruled to create something that made everyone stop and look. Make bold statements that challenge people’s expectations of what people with a learning disability can do. Our yarn bomb was all over social media within a couple of hours of its completion. Passers-by stopped and stared, smile, took photographs and read the messages left. We’ve already have a few knitted items taken, which we see as a success as it shows people liked them enough to bother to nick them! And hopefully less for us to take down! We wanted to crochet and had seen yarn bombs on the internet and wanted to have a go – that’s punk! We were inspired by Pow! Thanet and their celebration of women.